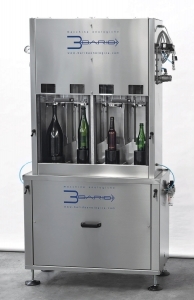 The compact size of the mono-block, including the high levels of efficiency and flexibility of the work cycle make this mono-block ideal for the small-to-medium size winery and brewery. The fully-automatic features reduce the required amount of workers needed. Dependent upon stability of the product and operator. Designed to fill and close any carbonated liquid (wine, beer, water, etc.) in glass bottles. 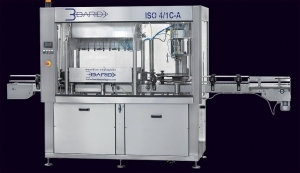 Fully-automatic system includes a turret with (4) filling nozzles equipped with an anti-foaming system, guaranteeing the utmost spreading of the liquid onto the bottle walls as well as pre-evacuation to remove air prior to filling. The operator can control the different process and filling stages from the on-board control panel, including flling, evacuation and gas discharging times. A counter pressure filler used to fill carbonated beverages (sparkling wines, soft drinks, beer, cider and mineral water. No-foam filling system w/rubber ring on filling pipe to reduce foaming. • Pneumatic bottle-lift with bottle centering device.